Find screw dimensions (all head types) with this online calculator #Making « Adafruit Industries – Makers, hackers, artists, designers and engineers! Have you ever wound up needing to know the dimensions of various standard screws in order to design your circuit board or enclosure? 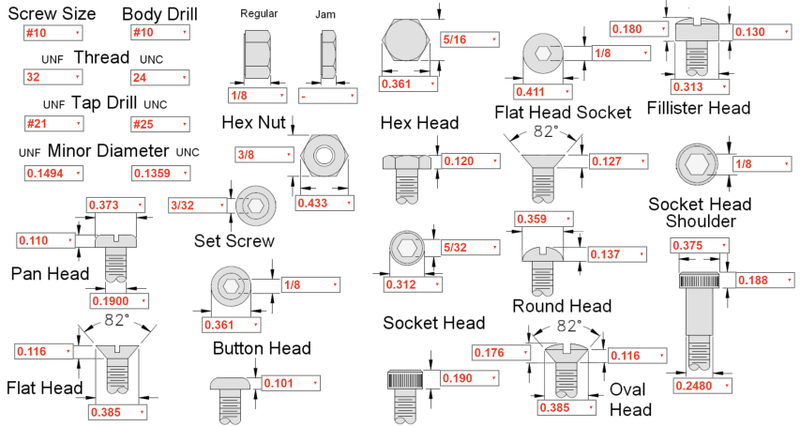 And which type of screw head makes sense, given how big the dimensions are? The Home Metal Shop Club in Texas has this wonderful online calculator which allows you to select parameters like screw size, thread count, drill size and it immediately provides a visual of the measurements for all the screw types! You can immediately see what’s what and select exactly what you need. You’ll have to get some catalogs to actually buy your specified screw, but you won’t languish in McMaster-Carr for 3 hours after having dialed in what you want, yay! And check out the host, http://www.homemetalshopclub.org/ for their great website.